According to the US secretary of defence, they may only provoke an aggressor. 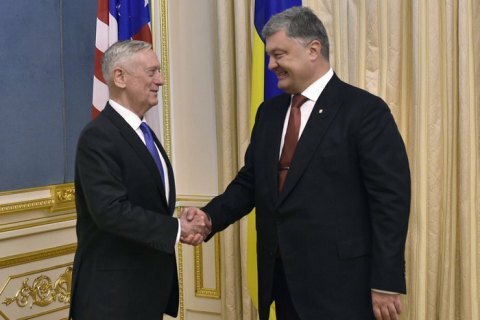 Ukrainian President Petro Poroshenko and US Secretary of Defence James Mattis met in Kyiv on 24 August, in particular, to discuss ways to improve Ukraine's defence capability. "We continued to discuss the issue of defence aid to Ukraine, ways to build up on the existing level of military cooperation. I expressed gratitude to our partners, above all, for effective military assistance which we have had since the first minutes of the aggression. We are very satisfied with cooperation in the training of Ukrainian specialists, advisers' help in reforming the security and defence sector. We agreed to expand this cooperation by taking it up to an operational level," Poroshenko told journalists. He said that he would not like to comment on any specific agreements with regard to lethal arms supplies. "I would not like to comment on these issues but I can say that I as the president is satisfied with our discussion. As the president, I'm satisfied with progress in this area," he said. Mattis said that upon his return to Washington, he would suggest specific projects in this area to the US administration. He said that defensive weapons may only provoke an aggressor which Ukraine is not.